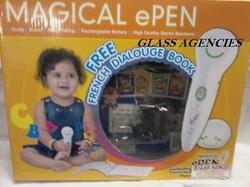 Glass Agencies EROSE are manufacturer of Talking Pen. Talking PenTalking Pen is an educational tool , which speaks out the audio encoded with its audio books . E-Teacher Talking Penhelps the children to develop their creativeness, imaginations and potentials. We are indulged in offering the finest quality Talking Pen. Note: Price may be negotiable as per order quantity. Speak-o-pen is a fantastic culmination of the Nanotechnology. There is a Speak-o-pen which can read out, sing, pronounce or recite rhymes, as soon as we touch it to the printed matter on the Speak-O-Book.